The main objective of project P5 is the development of innovative approaches for inland altimetry data analysis with special focus on automated methods in order to ensure reliable, fast, and comprehensive computation of water levels at best possible accuracy. This will allow for the estimation of volume changes for major surface waters beneath the satellites’ tracks (conducted by project P6) and is an inevitable prerequisite for monitoring and understanding the global freshwater system. An important step towards fast acquisition of inland water level time series from altimetry is the automated detection of water bodies, i.e. 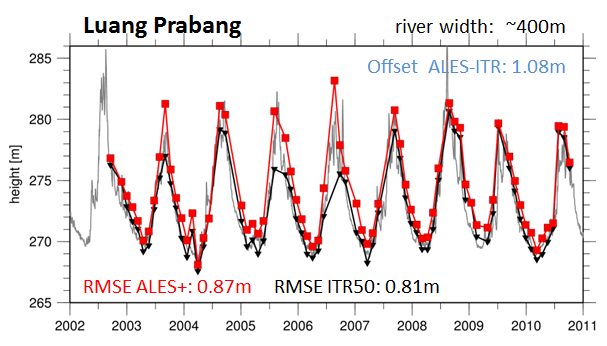 waters that are overflown by at least one satellite altimetry mission. 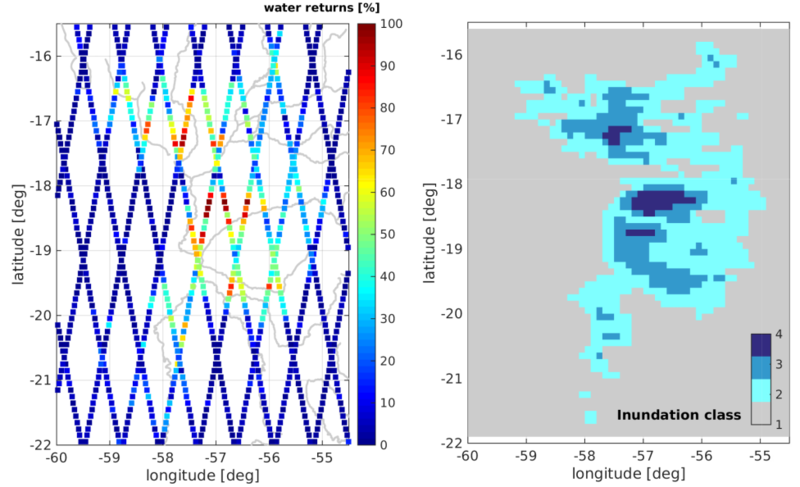 Thus, an algorithm is needed that decides for each measurement of a satellite’s track if it is recorded above a water body. This will be realized by the usage of external datasets in combination with purely altimetry-based methods. The difficulty of processing inland altimetry data stems from the fact that the water signal is superimposed by radar returns from all surfaces (e.g. vegetation, artificial structures…) within the altimeter footprint. In consequence, inland waveforms have complex shapes and varying qualities. A way to eliminate unusable waveforms, i.e. reflections from land or bad-quality data, is waveform classification on the basis of statistical parameters such as skewness, kurtosis, peakiness, maximum power, and signal-to-noise ratio. The complex shaped inland altimeter waveforms do not satisfy the Brown model for ocean waveforms in most cases. As a result, they have to be subjected to an additional processing step, called retracking, in order to infer reliable and accurate water levels. Even though a variety of different retracking algorithms exist, most of them are tuned to specific applications (e.g. ocean, small lakes and narrow rivers) or missions. The goal of this project is to come up with one (best) retracker that is applicable for all inland waters and all altimetry missions while providing consistent and unbiased heights that can be used for further processing in the RU. The project will focus on the improvement of the existing ALES+ retracker algorithm.